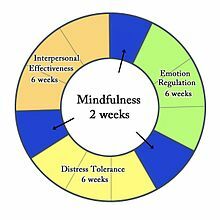 Dialectical behavior therapy (DBT) is a form of psychotherapy developed by Marsha M. Linehan, a psychology researcher at the University of Washington. Linehan originally developed DBT to help people with borderline personality disorder (BPD). DBT uses cognitive-behavioral techniques to get patients to control their emotions and test what reality is. It also tests the patient's tolerance for distress, and tries to get them to accept their situation and be aware of their feelings. Linehan's ideas about how to be aware of your feelings come from Buddhist meditation. DBT may be the first therapy that has been shown to be effective in treating BPD. It can also help patients with spectrum mood problems, including self-injury. DBT may help victims of sexual abuse and people addicted to drugs. ↑ Linehan, M. M. & Dimeff, L. (2001). Dialectical Behavior Therapy in a nutshell, The California Psychologist, 34, 10-13. ↑ Linehan, M. M.; Armstrong, H. E.; Suarez, A.; Allmon, D.; Heard, H. L. (1991). "Cognitive-behavioral treatment of chronically parasuicidal borderline patients". Archives of General Psychiatry 48: 1060–64. ↑ Linehan, M. M.; Heard, H. L.; Armstrong, H. E. (1993). "Naturalistic follow-up of a behavioural treatment of chronically parasuicidal borderline patients". Archives of General Psychiatry 50 (12): 971–974. PMID 8250683. ↑ Kliem, S., Kröger, C. & Kossfelder, J. (2010). (2010). Dialectical behavior therapy for borderline personality disorder: A meta-analysis using mixed-effects modeling. Journal of Consulting and Clinical Psychology, 78, 936-951. ↑ Brody, J. E. (2008, May 6). The growing wave of teenage self-harm. New York Times. Retrieved July 1, 2008. ↑ Decker, S.E. ; Naugle, A.E. (2008). "DBT for Sexual Abuse Survivors: Current Status and Future Directions". Journal of behavior Analysis of Offender and Victim: Treatment and Prevention 1 (4): 52–69. http://www.baojournal.com/JOBA-OVTP/JOBA-OVTP-VOL-1/JOBA-OVTP-1-4.pdf. This page was last changed on 31 August 2017, at 00:21.